Receding mist reveals a view rich in shape and texture on Huangshan (i.e., Yellow Mountain) in China. 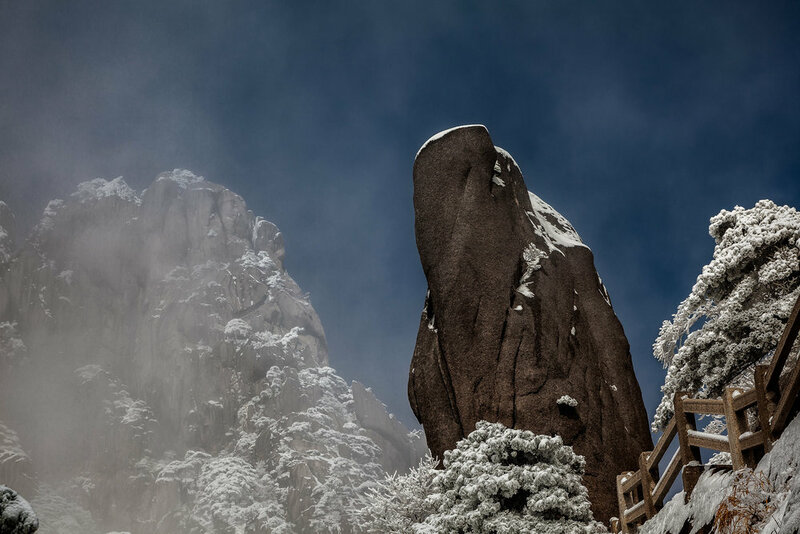 Regular visitors to my blog will know that one of my favorite adventures was a trip to Huangshan (i.e., Yellow Mountain) in Eastern China during the middle of winter. It was my fourth visit to China and, from this photographers point of view, my most successful. I've chosen the above photo as an example of the opportunities that await the patient and prepared photographer on the edges of bad weather. Moments earlier the entire mountain side was covered in cloud. However, after looking at the speed at which the clouds were moving, I felt that it was worth waiting around in the hope that a break in the clouds might reveal a stunning formation on the mountaintop. I was not disappointed. The mist swirls around a rock formation, acting as a silent sentinel, on Huangshan (i.e., Yellow Mountain) in Eastern China. The great American black and white landscape photographer, Ansel Adams, was known for his compelling images of the American west, particular Yosemite. While his photos include mountains, trees and water features (e.g., rivers, waterfalls, glaciers) it's perhaps his rendering of dramatic cloud formations against dark grey skies that are particularly evocative. In fact I'd argue that many of Ansel Adam's best photos are as much about the weather as they are about the mountain scenery with which he is normally associated. A sublime view, early in the morning, above the clouds on Huangshan (i.e., Yellow Mountain), China. Bad weather is, by it's very nature, unpredictable. But great light can appear, either side of a weather front, and transform the landscape in most remarkable ways. You need to be there, properly attired, with your camera ready as these truly serendipitous moments are fleeting. Patience and a willingness to gamble on the result is also necessary. But, to be in the game, you have to be there. If you don't put yourself out there on the edges of a weather front you simply won't get the image. It's a key difference between the armchair traveller and the adventurous, committed artist. Meals and relative comfort are pushed aside for the experience of witnessing and recording such sublime beauty. Photography is, after all, a game of compromise. From my point of view it's certainly worth it. What's more you have a record of your experience which is longer lasting and easier to share than a memory. One is made more powerful by the other.